This happened a couple of months ago in Gracepoint Austin. Please don't click on the picture to get a closer look at who the driver was. 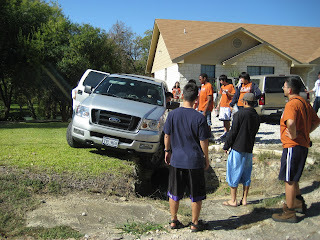 How many Gracepointers does it take to drive a truck into a ditch? Nine. One to drive, and eight to look at him and shake their heads. Mr. Mystery driver can't af-FORD to make that same mistake again. I knew whose truck it was anyway. Hope there wasn't any serious damage. wow, your ford must've been tired of hanging there. You don't need to click on the picture. Just hover over it. The title says it all. Who was the one busy taking this picture rather than take time to help out the poor brother? In reply, I believe there was a college sister already in a car waiting to leave when she handily took out her camera and snapped another memory making moment at Gracepoint Austin. Ford is going down the drain! the look on Margaret's face says it all.